Imaging a small boy sitting on a sand dune in Kitty Hawk in 1903 and looking out. What he could see is a pair of brothers who worked with bicycles setting up a strange new vehicle. That strange vehicle was the Wright Flyer. The first machine that was heavier than air to fly in a controlled way. 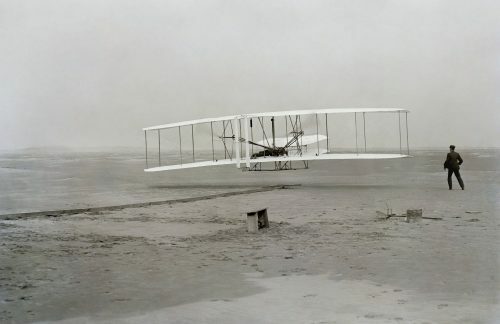 That first flight wasn’t that long at 120 feet, shorter than the wingspan of a modern 747, and taking only 12 seconds. Even so a new ground breaking invention was proven to work. By the end of that day they were flying as far as 852 feet. That flight was almost 7 times as far as the first flight of the day. Now let’s jump forward to, just over, a decade later and Europe was at war. Aircraft were flying at huge speeds and, at the start, nobody knew what to use them for. That changed when it was figured out how to attach machine guns to the aircraft. The invention of the fighter aircraft. The evolution of all the roles that military aircraft have today. The big and lumbering bombers, the fast and nimble fighters and the reconnaissance aircraft. All that’s changed between then and now is the technology of the day. This little by is now in his late teens or early twenties, what has become of him? Did what he saw changed his life and he decided to learn to fly? Could he have been flying in the latter days of that war? Who knows. Let’s dream that he did. In the inter-war years between 1918 and 1939 we saw a massive jump in technology and we could fly across America and then onwards to Europe. Records were broken, heroes were made. In this time we saw same of the greatest aircraft ever made. Some are still flying [ the actual aircraft not just the same type of aircraft ] over seventy years later. 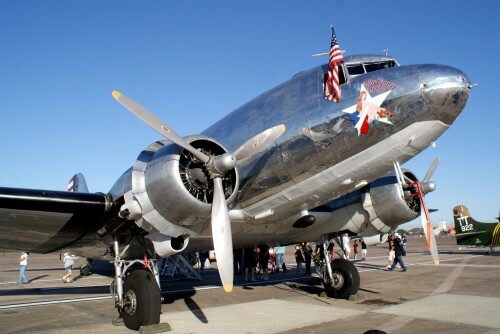 One being the Douglas Dakota. The backbone of the Allied landing in Normandy and then in the late 40s the Berlin Air Lift. Our little boy isn’t that little any more. He must be in his middle age, married with some children. He has seen the world getting so much smaller from that day sitting on the dunes 35ish years previously. The late 40s saw a second revolution in flight. The invention and use of a new technology. The jet engine. Invented in the 30s by a British inventor. Now aircraft could fly faster and above the weather so flying became more comfortable. It wasn’t safer as we didn’t know what happened to airframes because of what pressurising at height and then de-pressuring it when it came back to land. The 50s saw the new generation of aircraft. Military aircraft became faster but they were still using guns to try and shoot the enemy out of the sky. This did change with the invention of guided rockets that meant that you didn’t need to get as close as you had to in the World War that happened a decade earlier. It has now become affordable for the regular Joe to fly. Back to our observer. He’s now in his late 50s. Probably with his grandchildren running around the house causing chaos. The 60s came with a new outlook in life, as well as a new President. A charismatic young man called John Fitzgerald Kennedy. A man who had a dream. One to land a man on the moon, and return him safely to the earth, within that decade. Hopefully this young boy. Well, quite an old man by now, was paying attention to what he was hearing. Hopefully it reminded him about what he saw all those years before and hoped that this would come true in his lifetime. 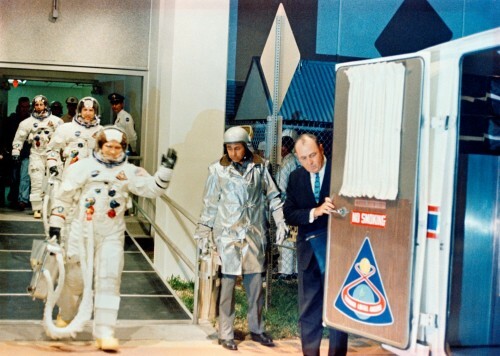 He is now in his late 60s when he saw John Glenn go up into orbit as well as the Russian Yuri Gagarin. The Space Race had begun and nobody knew who would win. That decade saw bigger changes than it did in that first decade of flight. He has lived through one of the greatest of centuries. He has seen the best and worst of humanity. He probably hasn’t been to war as he was born in America and, probably, missed the Great War. He was a little too old for the Second World War but he has seen people go off to war. He must have helped the war effort in his own way. The 60s was a decade of change. War in South East Asia that cost a lot of young American lives, the assassination of a President that made the world feel America’s pain and the race to the moon. The one thing that carried on was the race to space and the moon. Our observer saw one man being sent up at a time, then two in a capsule not that much bigger then the design of a vehicle for three that was designed to get them to the moon and back. Now 65 years after seeing two brothers getting something that was held together with glue and wire he was on the cusp of seeing man travelling to another planet. In his lifetime. I can see him watching the Apollo 8 mission telling the story of all those years ago about sitting on the dunes and seeing the first aircraft fly for miles and miles to his grandchildren, or possibly his great-grandchildren. He would have lived to see Concorde fly. All this in a single lifetime. Now look at what happened in the 40 years since our little boy passed away. We have seen Skylab, Mir, The first and last flight of the Space Shuttle and the construction of the International Space Station. Not that much compared to our little boy.